Since history seems to be the force that moves the world,it is a mystery that needs to be probed. Our history is a record of the politicians.intellectuals and think-tanks and their goals,what is to be done.What they had decided was inherited by the generation that followed.It was not necessarily the kind of destiny we wanted,but was thrust upon us. When I look and back think about our inheritance.I do not feel great.This has been going on since time began and will continue till the end of time. Countries and governments were formed by the decision of a few,the rest of the society had to agree perhaps reluctantly.This is politics. In education there was nothing different,the children had to study what was prescribed for them,they had no say,their opinion did not count.They had a series of masters,it started from the parents and ended with the job market. There comes a point in our lives when we want to fight the system,but the result is always disappointing. Dreams chosen through literature are turned into reality through politics.Iqbal says "Nations born in the hearts of poets;they prosper and die in the hands of politicians.The example of Pakistan comes to my mind. Education,passes its knowledge to the next generation,not much of it is filtered because what was important and crucial to know then is no longer valid for the present generation.I think in the field of education not much change has taken place,especially for the children starting school for the first time.This produces a whole bunch of children who use the word,'Hate',when they hear the word school.This is my opinion. Actually, the acts of politicians are not history. They are politics. Likewise, the acts of intellectuals and their ideas are not history either. They are intellectual baggage and education. 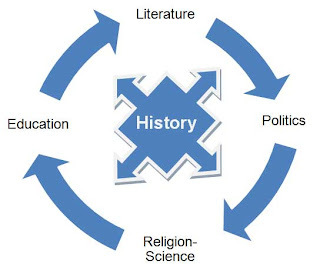 History is just a force, and needs to be discovered just like other forces of Nature - such as gravity, etc. The first step to discovering it is to know that it is not politics, literature, religions, science or education. Then what is it? That is the mystery to be unravelled. With patience. Personally, I believe that the way to begin is by contemplating on the Waheed Murad movie Heera Aur Patthar. I am thinking about developing an exercise on it, with a few clips to be sub-titled (since the complete movie is not available with sub-titles). But those who can understand Urdu, I recommend watching this movie (available on Youtube). I have watched Heera Aur Patthar a few times.I am a very dedicated fan.I would love to see what you come up with.Please develop the exercise,it would be fun to comment on it. I did not know there were any movies of Waheed with sub-titles.Robert wants to watch Waheed's movies with sub-titles.I told him he will figure it out with or without sub-titles.My daughter does not know Urdu but she seems to understand the dialogue. Yes, I think that the moview of WM can be figured out without sub-titles, especially Armaan and Ishara. The main thing about Heera Aur Patthar, which I find important for our understanding of history, is the parable about two brothers. After receiving education, the elder brother of a poor father marries a wealthy woman and tells her family that he has no relations. Now, he cannot acknowledge his poor father, sister and brother as his relations. They come before him and his family, but he has to pretend that they are just poor and needy people, unrelated to him. Symbolically, this is the dilemma of almost everyone who has received higher education in our times. In some way, and to some extent, we have become "estranged" to the rest of the humanity - the majority. History is not being determined by "us". It is being determined by everyone. Now, a majority of this "everyone" consists of those whom we have abandoned in the sense that our consciousness has become so different from theirs, we can hardly understand them, their motives, their joy and sorrow. The mission of Waheed Murad, which started with this movie, was to show us step by step who this gap can be bridged in the most pleasant manner, and to the satisfaction of everyone. The complete "method" is unfolded through nine films, produced under his own banner "Film Arts". So, what I am saying is that our recognition of history as a force distinct from politics, education, etc, begins by recognizing that history is that process which is being carried out by the lowest of the low, by the homeless sleeping on the pavement. Their healthy dreams, fantasies, joys and sorrows - as felt by them, and not as understood by us - are the force which I call history. I hope to be able to turn this into an interactive presentation from Heera Aur Patthar soon. I have the same feelings as Ranu and am waiting for that presentation on heera and pathar.